LaValle places support and belief of Trump ahead of own political future. 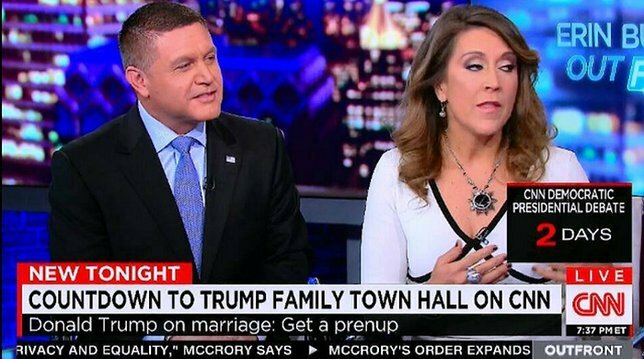 John Jay LaValle on CNN during the countdown to Trump Family Town Hall. 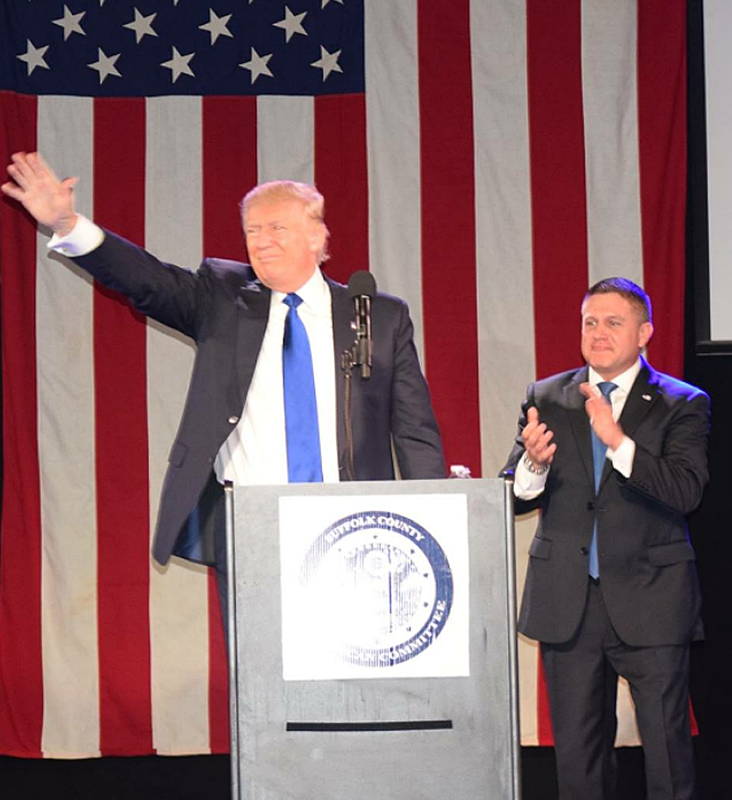 When on April 6, 2016 John LaValle, 48, the then and current Suffolk County Republican Committee Chairperson announced at a Long Island Trump political rally that he was endorsing the controversial billionaire for the GOP Presidential nomination, many leaders from both the Democrat and Republican parties were said to be in a state of shock. While it is rare to have them agree on any political matter, concerning LaValle’s endorsement of Trump, who came to Long Island that day to thank LaValle (as well as several other Republican leaders) for his support, they were in full accord. “It is strange to see Democrats and Republicans agree on anything. I guess it takes a Maverick like me to get that kind of bi-partisan agreement”, LaValle, whom I interviewed last week in his office in the Suffolk County Republican Headquarters, stated, wearing a broad smile on his face. Actually, it was little secret inside the political doors of both parties in Suffolk that many Republican and Democrat leaders were offering the same supposed near certainties on three interconnected predictions. The first was that Trump, who was running virtually without any support from the national party establishment, had little chance of winning the Republican Presidential nomination. The second was that even if by an extreme long shot Trump won the GOP nomination, he had even less of a chance of defeating the then certain Democrat nominee Hillary Clinton, who was beating him handily in almost every general election poll. Trump and John Jay LaValle at Rally in Patchogue, NY; Trump and John Jay LaValle celebrating a win; Photo credit John LaValle. Their third area of agreement was that by endorsing Trump, LaValle - a father of 3 young boys and an attorney, who prior to his selection as Suffolk County Republican Chair in 2009, had served as the Supervisor of the town of Brookhaven from 2000- 2005, and before that as a City Councilman from the same town from 1996-2000 - had just suffered a fatal self-inflicted political wound. The consensus of the political class throughout this eastern Long Island County of one and a half million citizens was that this “self inflicted wound” would all but end LaValle’s chances of winning the Republican nomination for County Executive in 2019. That nomination, which would have pitted him against two-term incumbent Democrat Steve Bellone in the general election, was widely considered to be LaValle’s for the asking, prior to the Trump endorsement. LaValle, now no longer smiling, told me that while he was well aware of this widespread bi-partisan belief that he had committed a major political blunder in endorsing Trump, he possessed no second thoughts at the time about his decision. “The stakes for America were too high for me to worry about my own political future. I was looking for the candidate who had the greatest potential to become a great president. Based on the domestic and foreign policy positions he proposed, and the strong, sincere and unapologetic way he proposed them, that candidate for me, I concluded, could only be one person: Donald Trump”, he told me. 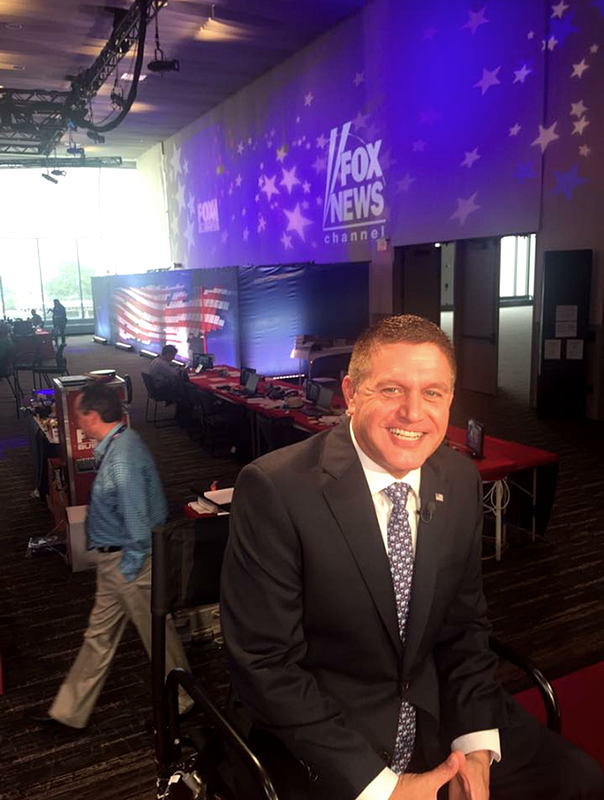 John Jay LaValle at Fox news before a show; Photo credit Fox News via office of John LaValle. LaValle said he was equally impressed by Trump’s domestic policies. “I was extremely excited by Mr. Trump’s pledge to unleash America’s own energy resources, his promise to remove literally thousands of useless and burdensome regulations off the backs of businessmen and women, his plan to secure our borders, and his commitment to rebuild America’s infrastructure”, he stated. On these and other domestic and foreign policy issues, LaValle noted that he found that the overwhelming majority of Republicans, many independents and even more than a few Democrats agreed with Trump, leading him to believe that his support of his candidacy was anything but Quixotic. “Because he was right on the issues, and because as a totally independent non-politician and extraordinarily successful businessman, he was the right person to articulate and champion those positions, I became convinced even during the most challenging days of the campaign that Donald Trump would be the next President of the United States”, he said. LaValle added that in addition to being impressed by the policies and positions of Trump, he was also impressed by what he perceived to be the future president’s positive personal qualities. “I originally endorsed Mr. Trump, whom prior to the event in Long Island I had met only once about 3 years ago, because I believed the solutions he proposed to, in his own words, ‘Make America Great Again’ would do just that”, he said. LaValle performed that role from the day he accepted Trump’s offer, up through the August Republican Convention, where he also served as a New York State Trump delegate, up until the night of the election itself, November 8th. Trump’s victory that night might also well prove to be great for the political future of LaValle. With his contentious decision to endorse Trump fully vindicated, Lavalle has reemerged as the overwhelming favorite to win, should he seek it, the Republican nomination for County Executive in 2019. In addition, it has been speculated in several New York news outlets that Trump, with whom LaValle is rumored to still be in contact, is considering him for an ambassadorship to one of the 26 Caribbean nations. Subject: LongIsland.com - Your Name sent you Article details of "Suffolk GOP Leader John LaValle: Playing The Winning Trump Card"